Average Weight	: 24-28 lbs. Records show that the Cocker Spaniel dates all the way back to the 14th century. The name "Cocker" comes from the woodcock, a game bird the dogs were known for flushing. 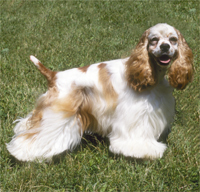 The American Cocker originated from the English Cocker Spaniels which were exported to the United States. These Spaniels, once on American soil, were bred down in size and given the name American Cocker Spaniels, and later officially called the "Cocker Spaniel" by the American Kennel Club. The American Cocker Spaniel is now even more popular than the original English Cocker Spaniel ~ The English Cocker being slightly different in appearance, with longer muzzles and larger bodies. The Cocker is a hunting-gun dog who shows great dexterity in difficult terrain in both wet and dry land. Excellent at flushing and retrieving game and known for their gentle mouth in retrieving. Cockers are well liked in the field as they prove themselves to be good 'team players' ~ listening well to commands. Their talents include tracking, hunting, retrieving, even watchdog, as well as excelling in Agility and Competitive Obedience. •	Bold and Intelligent this breed excels as a household pet as well as in the great outdoors as a Gundog. •	Gentle, sweet, amusing and trustworthy. •	Active, playful and devoted to all family members. •	Need to be socialized when young to avoid shyness. •	They get along well with other pets and children. guarding of food and toys, obsessive barking, hyperactivity and negative behaviors. •	They can live well in apartments and condos. •	Cockers are known for liking and needing regular exercise, or they can gain weight easily. The Cocker Spaniel is a happy, friendly and enthusiastic dog that is great with families and children. They are more likely to wag their tail and welcome a stranger than they are to act aggressive or territorial, although some Cocker Spaniels are good watchdogs and will bark when someone approaches. They are not a dominant breed of dog and are typically very willing and obedient and have an average ability to learn.The Cocker Spaniel is an excellent companion dog and is rarely dog aggressive especially if socialized properly. The Cocker Spaniel is not a timid dog; rather they are just easy going and willing to accept other dogs into their space. Cockers that have not been socialized may have a tendency to hid or run when they feel threatened, but with opportunity to go new places and meet new people and animals this problem is quickly overcome. The Cocker Spaniel is typically very good with cats and other pets however socialization will help this process. Many Cocker Spaniels that are raised with cats are very affectionate with the cat, allowing the cat to sleep in the same bed and even share toys. The Cocker Spaniel loves to be active and does best with a family where there is moderate to high activity, especially when the dog is young. They seem to enjoy interacting with children and are tolerant of even very young kids. The Cocker Spaniel can be left alone for short to moderate periods of time but do not do well when left alone for long periods. They do need human contact and interaction to be happy and content. Without enough attention they may be prone to habits such as chewing and barking, both which can become problematic. The Cocker Spaniel requires regular care and ideally daily or every other day brushing to stay in top shape. Their long, silky coat is prone to tangling and matting but is easy to maintain with a quick five minute grooming routine each day. These dogs love the attention so grooming really is simple and easy. If the dog is being used for hunting or in the summer seasons many people clip the Cocker Spaniel in a sport or puppy cut for easy care. The Cocker Spaniel is one breed that can tolerate frequent bathing and seems to really enjoy the whole process. Use only good quality dog hair products to avoid allergies and skin irritations. To groom the Cocker Spaniel start with a pin brush or wide toothed grooming comb and begin at either the neck or the rump area. Groom only in the direction of hair growth never up or forward. Try to section the hair and thoroughly groom each section before moving on to the next. Once all the long hair on the body and legs has been groomed finish with a slicker brush to get out any fine tangles. In rare cases it may be necessary to clip out a particular tangle, but try to do this as infrequently as possible to keep the coat looking even. The head and ears should be groomed with a soft bristle brush and with great care to avoid causing the dog any discomfort. The eyes and ears of the Cocker Spaniel will need special care. The eyes should be carefully cleaned with a water dampened cotton cloth. Do not use soap or any other products unless approved by your vet. Tearing is commonly a sign of an eye problem such as entropion or ectropion (rolling in or drooping of the lower eyelid) that causes eye irritations leading to excessive tearing. Removing any debris from the eye will help fight any infections. The eyes should be checked for any sign of wax build up or foul smelling discharge that can indicate an ear infection. Always take care when cleaning the ear and ever clean past the outer ear. The vet can flush out the ear if required. Be sure to check the toenails and clip or trim when necessary and brush the teeth using dog tooth products on an every other day basis for good dental health. The Cocker Spaniel is, by nature, a very active dog, especially when they are young. As they mature the need for long, sustained exercise is much less, but they still enjoy a brisk walk or a run through the park on a daily basis. The wonderful adaptability of the Cocker Spaniel means that they can adjust to various levels of exercise and although they are an active dog, can tolerate periods of inactivity without becoming hyper and destructive in the house, as long as the inactivity is not prolonged. One of the best ways to exercise a Cocker Spaniel is to simply spend time playing with these lovable dogs. They are usually natural retrievers and will spend hours either inside or out retrieving balls, sticks and Frisbees. Remember that it is important to avoid encouraging the Cocker Spaniel to jump as this can lead to joint problems as the dog ages. Ensure that the objects you are tossing are either close to the ground or are on the ground rather than having the dog jump up to try to catch them. Cocker Spaniels are also great at obedience and agility type classes, although they will need lots of practice to understand what you are requesting. Field lines of Cocker Spaniels that are actively used as hunting and gun dogs are typically more athletic than the show lines and will need additional exercise time. As with all breeds of dogs leaving the dog to its own devices for exercise is not usually productive as the dog will likely find a cool spot in the shade and take a nap. Often the best way to keep a Cocker Spaniel exercised in a busy family is to involve the dog in day to day activities of the family, or to get a companion dog that will encourage play and exercise. Two dogs will naturally keep each other busy as well as decrease the likelihood of problematic boredom behaviors beginning especially if they are alone during the day. Training the Cocker Spaniel should begin at the earliest possible age, especially in regards to socialization. A very friendly and affectionate breed, the Cocker Spaniel can become shy or nervous around new people if it doesn't become accustom to new people and places. Typically a Cocker Spaniel will have no trouble interacting with new dogs or other pets such as cats or rabbits or even livestock. They have little prey instinct although, like any dog, are more than willing to chase other animals just for the fun of it. The Cocker Spaniel is a very willing learner and truly wants to please the owner. Unlike some of the hunting breeds they do not have a strong streak of independence and are generally very compliant. Housetraining may be a problem for this breed and crate training is recommended to help with the process. They are very sensitive to the tone of voice used by the owner so it is very important never to raise your voice or use overly harsh tones when correcting the Cocker Spaniel. Crate training helps alleviate the need to try to correct the dog, as most experts agree that punishment is the least effective housetraining method for any breed. The Cocker Spaniel does best when trained basic commands with lots of rehearsal and practice. They do need time to learn the basics and do best when not overwhelmed with a lot of different commands all at the same time. Start with come and sit, move on to lie down and stay, then on to the more advanced levels of commands. Barking may be a problem so start early in encouraging the Cocker Spaniel to bark once or twice and then stop, don't let them get into the habit of lots of barking. Lead and collar training is important for this breed at an early age. They are generally very easy to train to heel, and a puppy obedience class can assist with all training requirements plus with socialization.